is an associate professor of psychiatry at the Albert Einstein College of Medicine in New York City and the codirector of the Program in Behavioral Genetics. He is the director of research of the Juvenile Bipolar Research Foundation, and is in private practice in New York City and Westport, Connecticut. 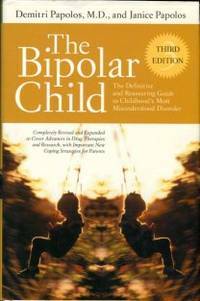 janice papolos is the author of three other books, all recognized as definitive in their fields, and is the editor of the highly respected Bipolar Child Newsletter. The Papoloses are the authors of the classic text Overcoming Depression, now in its third edition. They live in Westport, Connecticut. 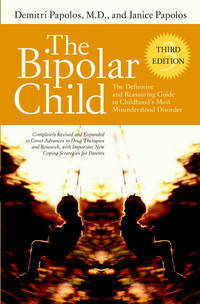 Visit their Web site at www.bipolarchild.com. Crown Archetype. Hardcover. GOOD. Spine creases, wear to binding and pages from reading. May contain limited notes, underlining or highlighting that does affect the text. Possible ex library copy, thatâll have the markings and stickers associated from the library. Accessories such as CD, codes, toys, may not be included. Broadway Books, 2006. Hardcover. Good. Disclaimer:A copy that has been read, but remains in clean condition. All pages are intact, and the cover is intact. The spine may show signs of wear. Pages can include limited notes and highlighting, and the copy can include previous owner inscriptions. An ex-library book and may have standard library stamps and/or stickers. At ThriftBooks, our motto is: Read More, Spend Less.Dust jacket quality is not guaranteed. Broadway Books, 2006. Hardcover. Good. Disclaimer:A copy that has been read, but remains in clean condition. All pages are intact, and the cover is intact. The spine may show signs of wear. Pages can include limited notes and highlighting, and the copy can include previous owner inscriptions. At ThriftBooks, our motto is: Read More, Spend Less.Dust jacket quality is not guaranteed. Crown Archetype. Hardcover. 0767922972 Ships promptly from Texas. . Fair. 2006. Broadway Books, 2006. Hardcover. Good. Disclaimer:A copy that has been read, but remains in clean condition. All pages are intact, and the cover is intact. The spine may show signs of wear. Pages can include limited notes and highlighting, and the copy can include previous owner inscriptions. The dust jacket is missing. At ThriftBooks, our motto is: Read More, Spend Less. Broadway. Used - Good. Former Library book. Shows some signs of wear, and may have some markings on the inside. Broadway. Used - Good. Ships from Reno, NV. Former Library book. Shows some signs of wear, and may have some markings on the inside. 100% Money Back Guarantee. Shipped to over one million happy customers. Your purchase benefits world literacy! Broadway. Used - Like New. Ships from Reno, NV. Book in almost Brand New condition. 100% Money Back Guarantee. Shipped to over one million happy customers. Your purchase benefits world literacy! Crown Archetype. Hardcover. 0767922972 Item in good condition. Textbooks may not include supplemental items i.e. CDs, access codes etc... . Good. Crown Archetype. Hardcover. 0767922972 Hardcover in dust jacket, minor wear, previous owner name on inside front cover, else a nice copy. . Good. 2006. Crown Archetype. Hardcover. 0767922972 Crisp pages. Tight binding. Moderate shelf wear on dust jacket. Edges are slightly dirtied. Price sticker on the cover. Water staining. . Very Good. Westminster, MD, U.S.A.: Broadway Books,, 2006. normal edge wear, 3rd edition, few dog earred pages o/w clean, the definitive and reassuring guide to childhood's most misunderstood disorder. Hard Cover. Very Good/Very Good. 8vo - over 7¾" - 9¾" tall. Crown Archetype, 2006-08-22. Hardcover. Good. New York: Broadway Books. Hardcover. 2006. 3rd Edition. 8vo 474pp . Fine in Fine DJ. Crown Archetype. Hardcover. 0767922972 Item in very good condition! Textbooks may not include supplemental items i.e. CDs, access codes etc... . Very Good. Broadway, 2006-08-22. Hardcover. Like New. Book has slight shelf wear from storage and use; otherwise the book is in very good condition. Crown Archetype, 2006-08-22. 3. Hardcover. Used:Good.